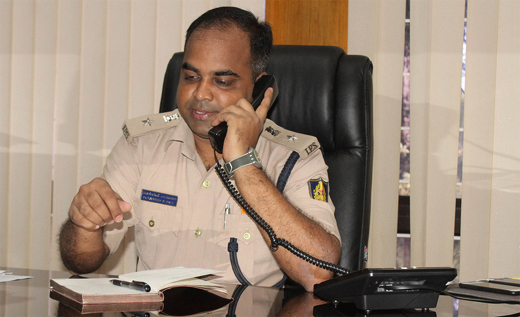 Udupi, Oct 15, 2017: Udupi’s Superintendent of Police Sanjeev M. Patil has said that if minors are found driving, the police will not hesitate to book cases against their parents. Responding to a callers during the weekly phone-in programme organised at the District Police Office Oct 14, Saturday. Total of 26 calls were received during the hour long phone-in programme. Besides booking cases, even the vehicles driven by the minors will be seized, he said. If there are any accidents owing to the minors driving the vehicles, the parents will be made accused in such cases, he said. He said the police had got information about ganja being brought from other districts, and they were keeping a hawk’s eye on it. We registered 93 cases for use of shrill horns, 90 cases against rash driving, 28 cases of drunk driving, and 1,119 cases for not wearing helmets last week, he said. SP Patil warned people against falling prey to messages stating that they had won online prizes. If they are receiving such calls or messages, they should inform the police. When a caller said that the number of buses from Kundapur to Hungarcutta was reduced and was causing hardship to the people, Mr. Patil said the police will take action against it. A caller said that a building near Diana Circle had put up a board stating that the building was weak and people should not go near it. Who will be responsible if the building collapses and falls on any person, he asked. Mr. Patil said that he will talk to the Commissioner of Udupi City Municipal Council and appropriate action would be taken. Another caller said that an astrologer had already taken Rs. 7,500 from him and was asking for another Rs. 37,000. The astrologer had told him that his life would be in danger. Mr. Patil urged the caller not to give any money and instead register a complaint if the astrologer sought money again.